Da Bears Blog | What can the Bears expect from Kevin White in year 1? What can the Bears expect from Kevin White in year 1? When the Bears drafted wide receiver Kevin White from West Virginia with the 7th overall pick of the draft, the expectation was that he would step into the starting lineup opposite Alshon Jeffery and make a significant impact in his rookie season. Many fans certainly expect great things from White, starting in 2015, with a few even suggesting to me on Twitter recently that they think White will lead the Bears in receiving yards. With that in mind, I wanted to take a look at the history of rookie wide receivers similar to White and see what they have done as rookies. Thus I looked at every wide receiver drafted in the first round from 2006-14, a sample size of 30 players. A full list of players, along with their rookie stats, can be viewed here. Over the last 9 years, the average rookie receiver drafted in the first round has received 88 targets, caught 50 passes, gained 689 yards, and scored five touchdowns (this excludes AJ Jenkins, who recorded no statistics his rookie year, and Robert Meachem, who spent his rookie year on injured reserve). But these numbers fluctuate tremendously; three receivers topped 1,000 yards (including one who had over 1,300), while four failed to record even 300 receiving yards. Let’s look at how that production spreads out; the graph below shows the number of receivers in various ranges of receiving yards. There is a pretty good spread across the board. Between three and five players filled every category of 100 yards between 400 and 1000 yards, as well as more than 1000 and less than 400. So it’s clear to see that the range of possibilities for Kevin White as a rookie are very broad. Of course, you can argue that rookie seasons from eight or nine years ago don’t have much impact on 2015, as passing stats have exploded over that time frame. There is some merit to that logic, but don’t get carried away. Many fans remember the monster rookie seasons put forth by the 2014 class of rookie wide receivers and think that will be the norm going forward, but a closer look at the trends makes it seem likely that will prove to be an outlier. To illustrate this, the graph below shows the average number of receiving yards for 1st round picks each year since 2006 (note 2008 is excluded because there were no 1st round picks at wide receiver that year). As you can see, 2014 showed a huge jump in production by rookie wide receivers drafted in the 1st round, and expecting that to repeat itself does not seem realistic. Overall the production of 1st round picks wide receivers doesn’t seem to have changed much since 2006, though it does fluctuate a bit from year to year. Now I want to look at players more closely resembling Kevin White in a variety of factors. I’ll start with draft position. White was drafted 7th overall, and the expectations for a player like that compared to somebody drafted late in the first round should be different in their rookie seasons. So let’s look at how the 10 receivers drafted in the top 10 since 2006. 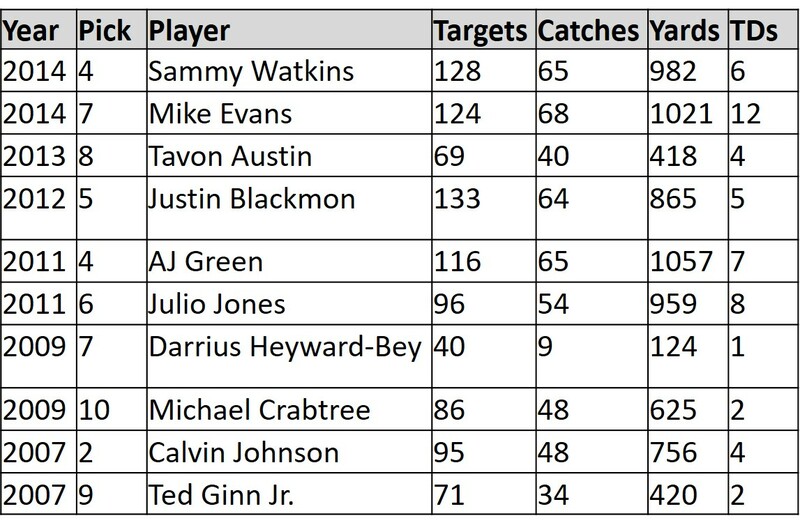 The average production of these players is slightly higher than the average production of 1st round receivers as a whole in the last nine years; these 10 players averaged 96 targets, 50 catches, 723 yards, and five touchdowns as rookies. Again there is a lot of fluctuation, with two players topping 1,000 yards and three failing to reach 500. Of course, one thing that could impact White’s production as a rookie is that the Bears already have an established player across from him in Alshon Jeffery. On the one hand, this helps White, as he will not draw as much attention from opposing defenses. But it could also limit White’s targets. I counted 9 other 1st round receivers between 2006 and 2014 who went into a similar situation. Let’s look at how they did in their rookie years. These players definitely fared a little better than rookie 1st round receivers as a whole; they averaged 90 targets, 53 catches, 760 yards, and five touchdowns in their rookie seasons. So it seems that having an established number one receiver opposite you as a rookie does help make the transition easier for rookies. There is definitely potential for Kevin White to have a monster rookie season like Mike Evans, Odell Beckham Jr., and Kelvin Benjamin did in 2014, but expecting that seems unrealistically optimistic. Rookie 1st round receivers have been spread out pretty evenly from 400-1000 yards over the last 9 years. 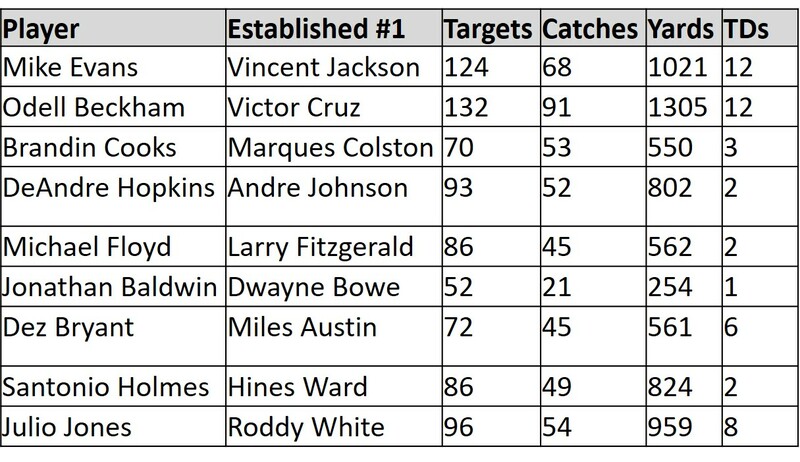 A slight boost is seen for players drafted in the top 10 and players going to teams with an established number one receiver, two things going in Kevin White’s favor, so expecting that he might put up something in the range of 800-900 yards as a rookie seems reasonable. Stay tuned for the 2nd half of this article, when I will look at comparables from this list for Kevin White based on physical measurables and college production to see what we might expect from him over the course of his career.